Historians studying the medieval and early modern period take different approaches to reconstruct personhood and its models, according to Gadi Algazi, professor and head of the Department of History at Tel Aviv University, and associate research fellow at Humboldt University, Berlin. 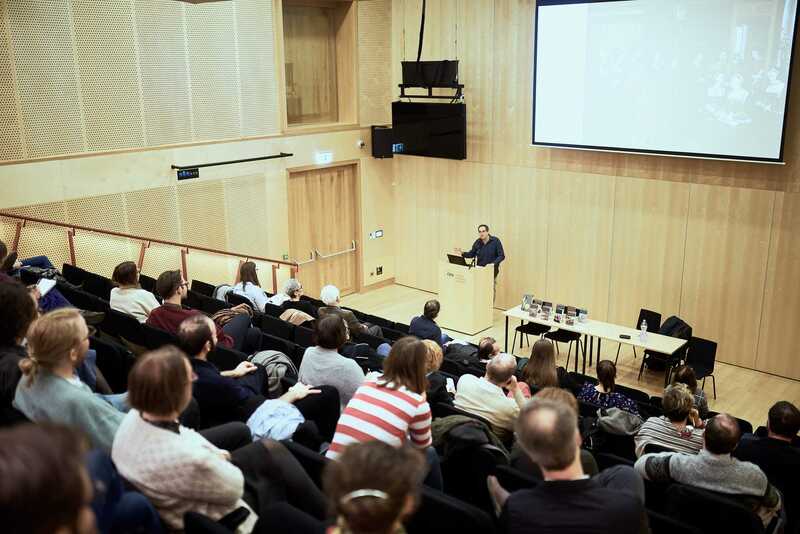 Algazi spoke at CEU November 6-9 as part of the Natalie Zemon Davis Annual Lecture Series, hosted by the Department of Medieval Studies and the Department of History. In the series, named for Natalie Zemon Davis, adjunct professor of history and anthropology and professor of medieval studies at the University of Toronto, each year a renowned historian is invited to give three talks on his/her current research topic; scholars such as Peter Burke and Dame Averil Cameron have been featured. This year marked the 12th series; nine of the lecture cycles have been published as separate books by CEU Press. Zemon Davis attended this year along with students, faculty, and noted historians from many institutions. 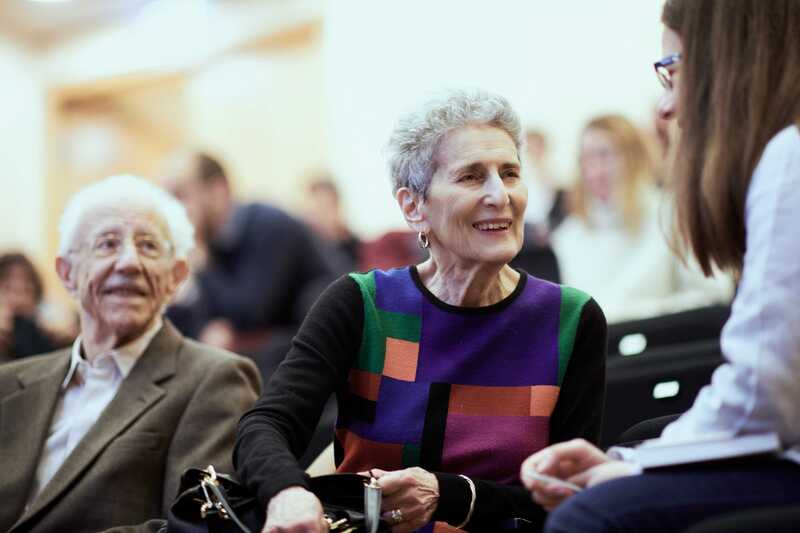 Natalie Zemon Davis speaks with CEU Associate Professor Tijana Krstic at the lecture series in November 2017. Photo: CEU/Daniel Vegel. In his three talks, titled “Self-Forgetting in the Late Middle Ages”, “Self-Fashioning, the Other Way Around”, and “Ways of Life: Toward A Longer History” Algazi offered different approaches through case studies on how historians reconstruct “templates” of personhood as models of sociocultural history. Past notions of the self, elaborated by literati, does not equal to models embedded in past realities. Moreover, there is always a danger of anachronism, as we tend to see persons of the past not only as partly imagined due to the lack of proper sources, but also as “imperfect versions” of our modern sense of the self. The first lecture explored how “forgetting oneself” was perceived and interpreted in the medieval and early modern period. Algazi cited quite contradictory examples: sometimes the self was identified with fundamental, imposed and objective social norms and rules, and self-forgetting was associated with subordinate groups caught in transgressions; in other cases, self-forgetting was described by mystics as their experience of union with God. Gadi Algazi, professor and head of the Department of History at Tel Aviv University, and associate research fellow at Humboldt University, Berlin. Photo: CEU/Daniel Vegel. The second lecture focused on fashioning and shaping the self, often the self of others, sometimes even through educational or domestic violence, and how the act of shaping others’ identities intertwined politics, court life, diplomacy, as well as family matters. Self-fashioning was an important practice for scholars, too, not only in terms of their public image, but also for the management of their own lives: wives and assistants whose malleable identity could be molded to meet the scholar’s needs provided indispensable support. In the concluding lecture, Algazi discussed ways of life as parts of a past social community. He focused on how humanists, relying on the traditions of monasticism as well as courtly customs, embraced a scholarly lifestyle, and how they experimented with its different forms before it emerged as an established, long-lasting social construction. The 2017 lecture cycle is expected to be published as a book at CEU Press soon. This article was prepared by Kyra Lyublyanovics, research assistant at the Department of Medieval Studies. 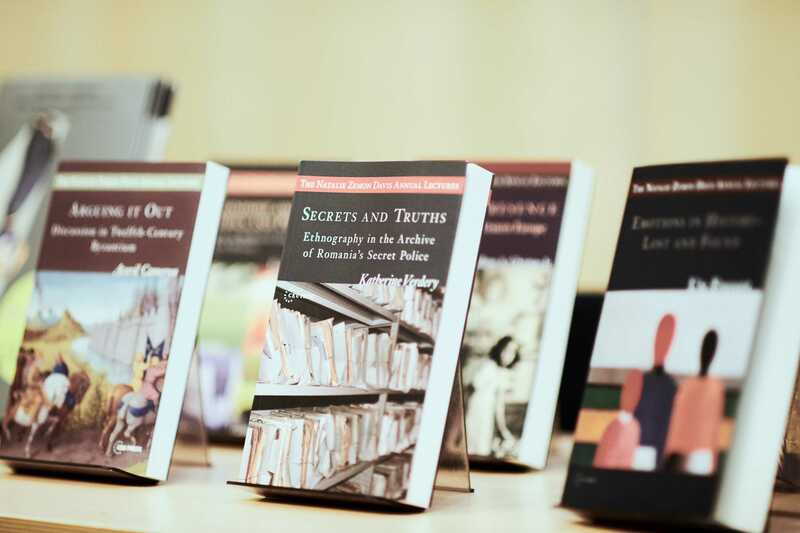 The Natalie Zemon Davis lecture series are often published in book form by CEU Press. Photo: CEU/Daniel Vegel.